How many times are patients made to wait at a doctor’s clinic, despite booking an appointment in advance? Are questions about payment and insurance always answered in advance? Are patients able to remember all the post-treatment advice given to them? Do most clinics still use phone-based appointment booking systems? These are some of the questions I was considering when I thought how can healthcare professionals offer a more pleasant and smoother experience to their patients. When I sat down to look up examples of small clinics and medical practices that are using digital marketing strategies, I was ready to be disappointed. I’m sure you’ll agree, the idea that doctors, chiropractors, dentists, and physiotherapists using digital marketing (or even being aware of it!) seems a bit out of place. This is because we have to come to expect such serious and direct services from the professionals in the healthcare industry that we hardly associate them with modern marketing tools and systems. However, I am happy to report that I was able to find some great examples of private companies doing healthcare digital marketing really well. In this post, I will be discussing 3 examples of small businesses in the healthcare industry that have a fantastic digital presence. I will also suggest a few ways in which they can further improve their digital marketing strategy, by building on the foundations already present. Let’s jump right in! 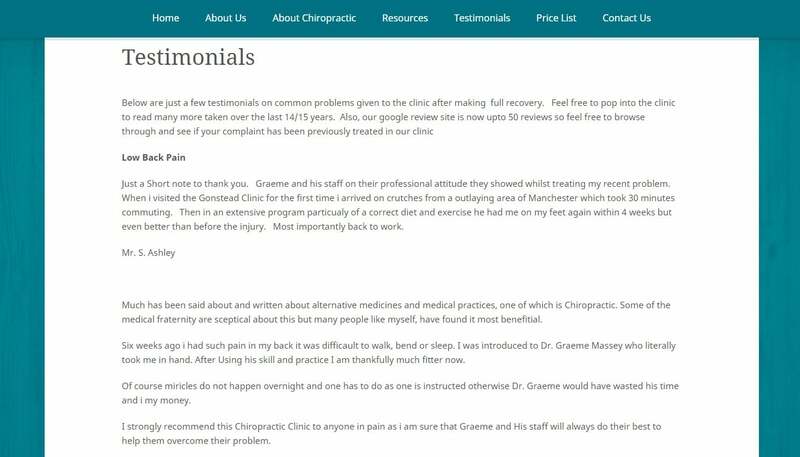 While chiropractors have been helping people with pain and disorders for a really long time, they’ve rarely had to ‘market’ themselves. Most practitioners have a dedicated following of patients and depend on word-of-mouth recommendations. So it’s no surprise that chiropractic clinics having a decent website and focusing on their customer experience seem to be few and far between. 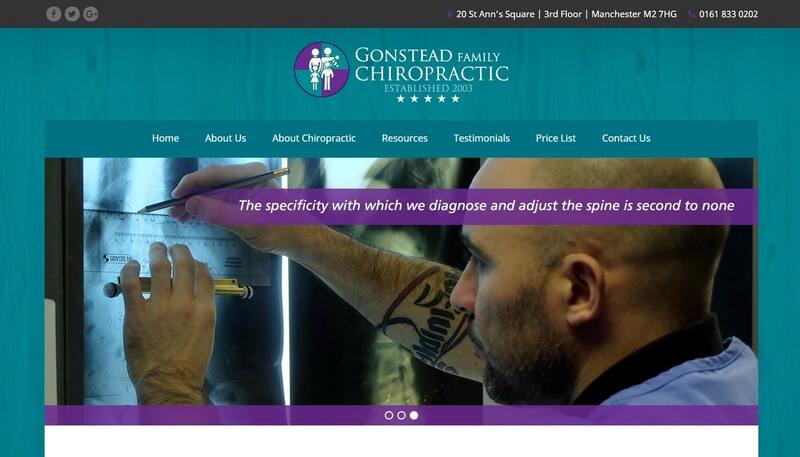 That’s why Gonstead Family Chiropractic in Manchester caught my eye. Although they aren’t using an intelligent marketing tool, like ONTRAPORT, they are definitely on the right track. Let’s take a look at what basics they have gotten right, and what kinds of opportunities exist. To begin with, the website is really well-done. It is simple and easy to understand, with just the right amount of information to get the visitor interested. There are not a lot of elements that compete for attention and at any given time and there is only one piece of information for the website visitor to focus on at any given time. The use of images is also very good; they are well-shot and not too much in number. The top menu is a permanent feature of all pages, which allows a quick access to the most important information like their resources, testimonials, and the fee for consultation and examination. 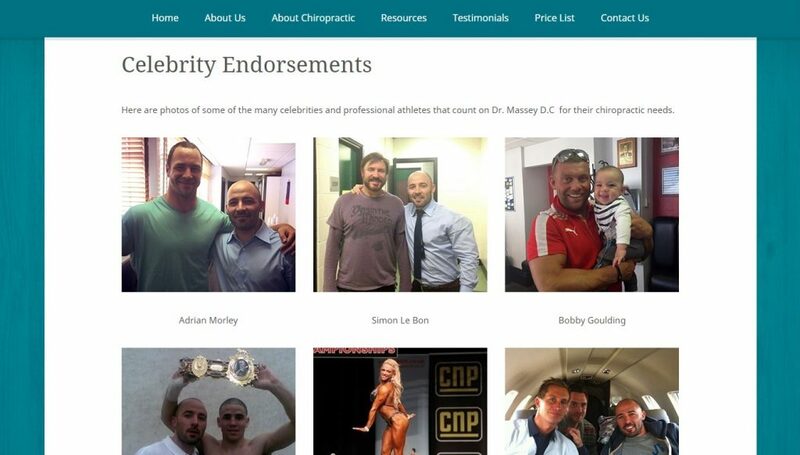 Celebrity Endorsements have been featured prominently on the landing page, in addition to having a dedicated section on the website. What deserves a special mention is that endorsements by celebrities have been featured prominently on the landing page, in addition to having a dedicated section on the website. Seeing a public face visiting the chiropractic clinic instantly builds trust and increases the chances of new patients booking an appointment. If you look at the pictures, they have all been taken casually when the celebrities have visited for a session. This gives a personal and non-commercial dimension to the endorsement, which makes it all the more effective. Although Gonstead checks many boxes, there are a few things that need some attention. For instance, other than the ‘Contact Us’ form, there is no other place where website visitors are asked for their contact information. This is a huge missed opportunity that can dramatically increase engagement levels across new and existing patients. A prominent ‘Get in Touch’ or ‘Book an Appointment’ button should be visible on all website pages. Using an online booking system to help collect, store, and organize all this information will allow Gonstead to manage appointment schedules efficiently and ensure that patients who turn up on time aren’t made to wait. The testimonials section also needs an overhaul of design and presentation and could use some images or videos. Currently, there’s a wall of text on the page and new visitors might not read it in its entirety. The testimonials section needs an overhaul of design and could use some images or videos. The ‘Resources’ section would be better off in a compressed downloadable PDF file, which website visitors can download in exchange for their email address or other contact information. What’s more, a dedicated blog that is routinely updated with health tips, surveys, health news, and related information, can do wonders to enhance the credibility and expertise of the practice. New blog posts and updates can be shared with mailing lists to establish trust over a long period of time and ensure that Gonstead becomes a memorable and recognisable name. A blog will also help in boosting the searchability of the website on search engines. These are small changes that can really take their marketing efforts to the next level. 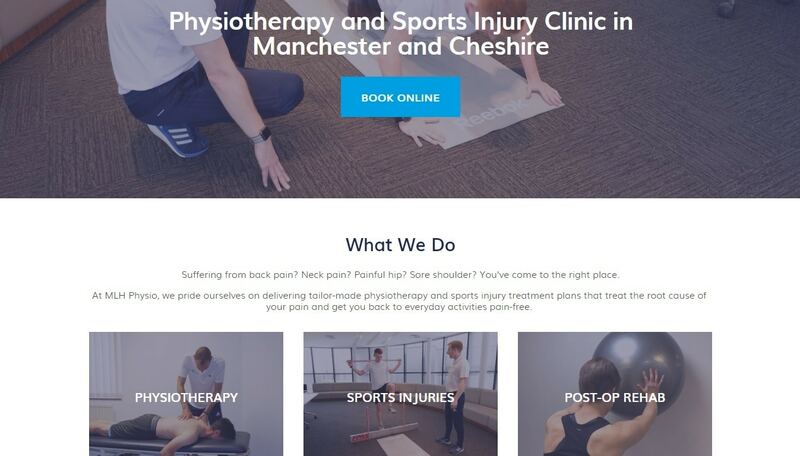 MLH Physio is a great example of how organizations in the healthcare industry need to make a first impression through their website. 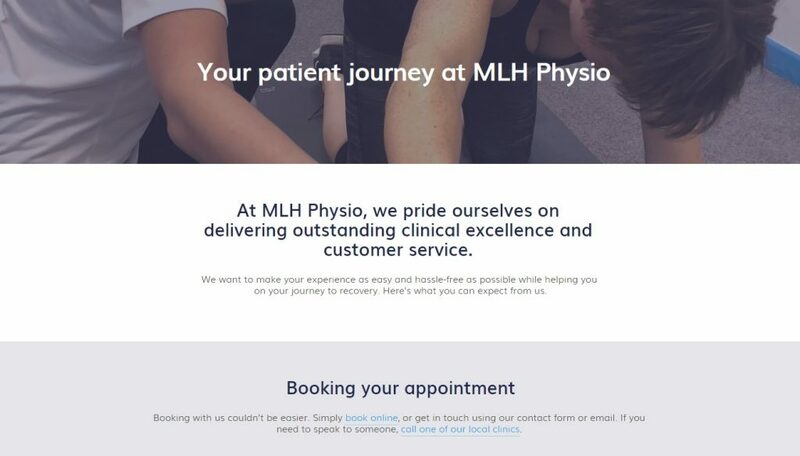 I am sure that MLH Physio is able to care for their customers in a much better manner by automating things like appointment scheduling and answering preliminary questions before patients come in for their first visit. The fact that their patients are giving them glowing reviews shouldn’t come as a surprise. The first few things a visitor sees on the website is what makes all the difference. Firstly, there are a lot of high-quality and professionally-shot images that instantly indicate that the quality of services on offer is high. Secondly, a very prominent ‘Book Online’ or ‘Book an Appointment Online’ button grabs attention. Both these features accomplish two major goals of establishing a personal connection and providing the user with an easily-accessible way to book an appointment if they are interested. 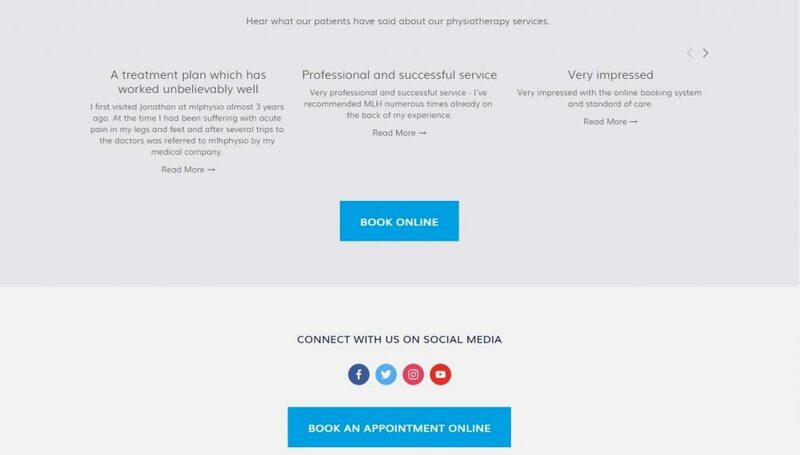 As the website visitor scrolls further down, all critical information like basic questions about physiotherapy, clinic locations, testimonials, and links to social media handles is displayed in a simple and easy-to-follow manner. The clutter-free design, alongside the subtle colour-scheme, works really well. In just a matter of a few seconds, MLH is able to convey all business-critical information that is needed by a potential new patient to decide if they want to book an appointment or not. The ‘patient journey’ page, which is currently the most under-utilized page on the entire website, has the potential to help patients, both new and old, answer a lot of recurring questions about the process of using MLH’s services. While the steps of the patient journey have been mentioned clearly, supporting resources and interlinking to relevant pages is missing in a few of them. For instance, the post-treatment advice, next appointment, and payment and insurance are topics which are likely to elicit the maximum number of questions from patients. Supporting resources and outbound links which provide detailed answers to recurring questions can make the page much more effective. In this context, the wonders that a simple multiple question survey will do at the very beginning of the page. This survey can help new visitors determine if they have an injury or require physio-related treatment, and end in a prompt to book an appointment. These pieces of content will deliver amazing free value to website visitors in exchange for their contact details. Finally, using videos could help MLH engage with new patients. A special section can be dedicated to ‘Video Tutorials’ to explain how physiotherapy works, how to speed up the healing process, simple ways to stay active, and how to exercise the right way. Video testimonials of patients who have benefitted from the practice can be added to this mix, and a documentation of their healing journey could be used to garner trust and confidence. 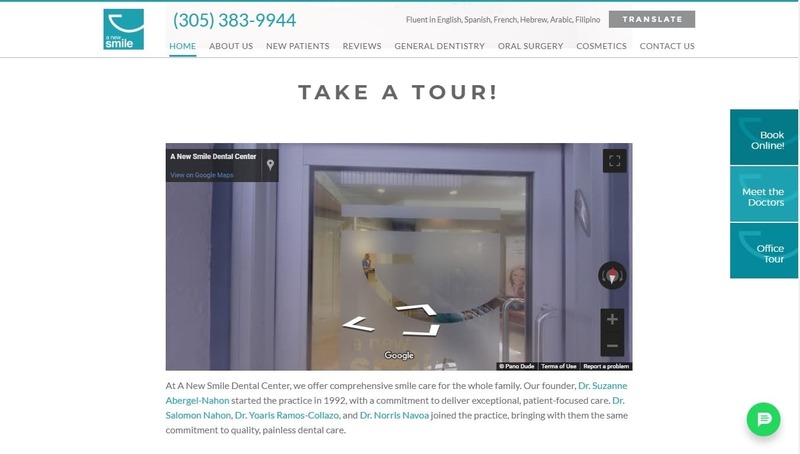 A New Smile Dental Center in Florida is a family founded and run dental practice that caught my eye while researching for this post. I was pleasantly surprised by how well-managed their social media handles were, how warm the video testimonials of customers were, and the prominent focus on the doctors and staff of the practice. I am sure that potential customers feel instantly compelled to book an appointment after going through their website. Let’s analyze where A New Smile hits the nail on the head, and where it could use a little help. 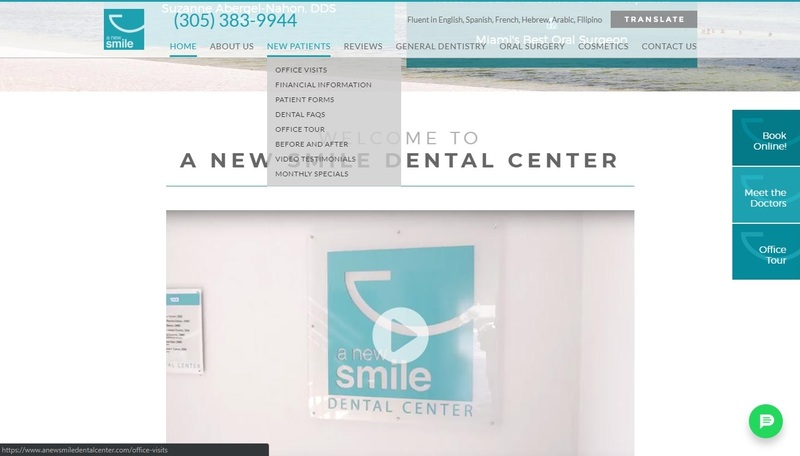 The dental center has a stunning website. With ample images of the staff, the clinic, and detailed ‘Meet the Doctor’ descriptions, the website aims to develop a personal connection and succeeds at it. Giving a face to a name instantly increases trust, and employee images indicate that patients are meted with warm and professional care. The website also has a great virtual walkthrough of the practice that allows you to see what it’s like inside which is, again, a great to develop confidence and trust. 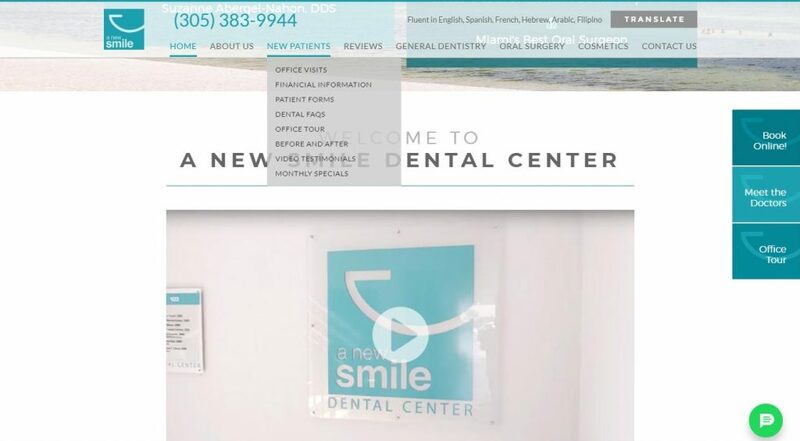 With ample images of the staff and the clinic, the website aims to develop a personal connection. In addition to a simple online booking system (more on that later! ), the website uses an SMS system to confirm appointment bookings and communicate other updates; thus, ensuring that no patient misses out on any alerts. New customers can simply enter their name, number, and a short message to hear back from the practice. A marketing tool like ONTRAPORT can help in storing and organising patient information effortlessly. 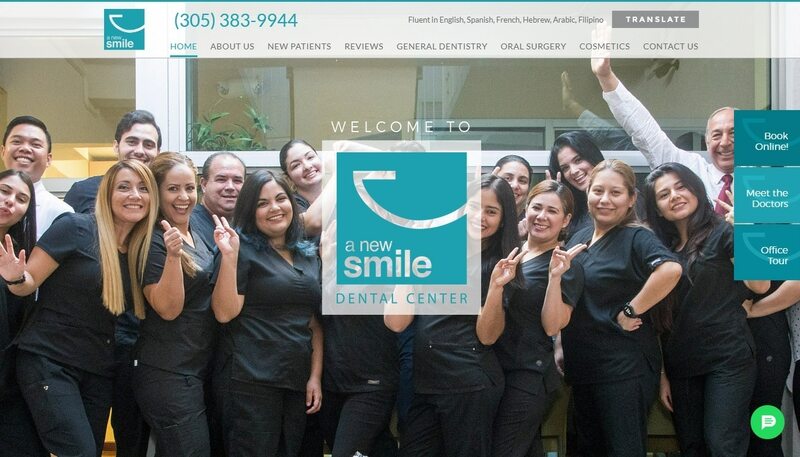 Next, while I am sure that all dental practices and dentists have a list of customers who swear by them, A New Smile displays them clear and impactful way on the homepage. Alongside 5-star reviews of customers, quick links to social media profiles are placed strategically for new and existing patients to follow and stay connected. The website has a great virtual walkthrough of the practice that allows you to see what it’s like inside. While the website has a lot of elements to engage visitors, the sheer amount of information and features on the website works as a double-edged sword. There are a lot of things happening at once: reviews, services, employee photos, Instagram pictures, virtual walkthrough, book an appointment, know your doctor, and so much more. From a new patient-perspective, not everything is needed. Maybe the homepage could have lesser elements to not overwhelm new visitors. From a new patient-perspective, there are a lot of things happening at once on the website. The website could also improve the experience of online booking and use a tool like Calendly to reduce the number of fields to be filled for an appointment. Furthermore, contact information of visitors to the website should be collected to maintain a database of new leads and existing customers. Another idea is to maintain a regular blog. A blog will be able to tie in all communication and updates from the clinic, patients, social media handles, and also offer valuable content to existing and new patients. Maybe the doctors could write a weekly or fortnightly post on the same to discuss various aspects of dental hygiene and establish their expertise. This will not only provide additional value to patients, but keep reminding patients of the practice, offers, and updates regularly, thus keeping A New Smile at the top of the patient’s minds. While they may be in a minority, some healthcare industry professionals have an excellent understanding of the importance of marketing and have a good grip on the basics of digital marketing. But, as discussed above, even they need to up their game and continually work towards improving the patient experience. Using a powerful marketing automation tool like ONTRAPORT can really help businesses in the healthcare industry to attract and retain new customers. The industry is extremely competitive and there’s no room for being complacent. So make sure you’re prepared to compete with the very best, and that you offer your patients a personal, empathetic, and caring experience from the moment they start interacting with your practice.